We sell our standard colored babies for $275.00 each. The standard colors are brown and gray. The brown Sugar Gliders usually have chocolate markings and a yellow under-belly. The gray Sugar Gliders usually have a black markings and a white under-belly. There are also many gliders that are a blending of the two colors and occasionally we have special colors available. These are colors that we have selectively bred for, and are in great demand, but in low supply, so they are more expensive. 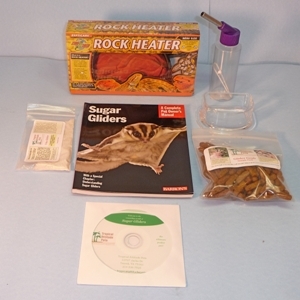 Our “Cinnamon” gliders are a reddish brown, and sell for $375.00. Our “True Blonde” gliders are straw blonde on their face and underside, and their bodies are a lighter color as well. They sell for $600.00 to $1000.00. You may have to wait for a special color, but they are well worth the wait. Since we travel to many cities selling the gliders, cages and supplies, it is possible that we can meet you with your pre-ordered glider at a show near you. 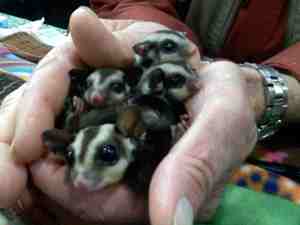 If you are interested in a special sugar glider, please contact me by telephone to see if we have any available.